Today we're updating Stacks to add some improvements for upcoming changes to RapidWeaver and to fix the one little bug we had with Sierra -- the new version of Mac OS X -- or should we say macOS now? Important: these feature are only available when using Stacks 3.2 in conjunction with RapidWeaver 7.1 or macOS Sierra. Both of which are in beta now, but not generally released. 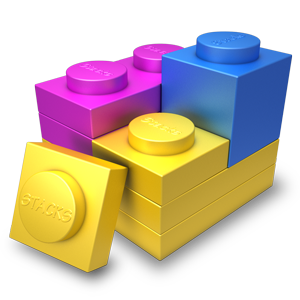 If you're not running these new versions of RapidWeaver or Sierra, then don't worry -- this version of Stacks will work just fine (and maybe even run a bit faster) -- and you'll be ahead of the curve for all the great stuff coming soon from Realmac and Apple. A longtime feature request has been to allow partials to save to your site, even when you're not using them. When used with RapidWeaver 7.1 that is exactly how it will work. Up until now Stacks would manage your partials for you -- deleting them from your file as soon as you stopped using them. This was a bit unexpected to many users -- but up until now it was the only way possible. RapidWeaver 7.1 changes all that. Going forward Stacks will keep all your partials, no matter if they're being used or not. You can delete them by choosing Remove from Library from the pop-up menu. The details of RapidWeaver 7.1 are still under wraps and being tested -- but what I can say is that Stacks 3.2 will take full advantage of all the new API hottness when it arrives. I'll blog more about it later when those changes come. Tease: If you have lots of Stacks pages in your site you'll really like it. If you're using macOS Sierra (the next version of Mac OS X) then you may have noticed that the library view doesn't update quite right when you scroll. Sierra has optimized some graphics routines exposing a bug. But it was a simple fix. And the library should scroll as smooth as butter, just like before.